Hakusan, Japan, April 20, 2016 – EIZO Corporation (TSE: 6737) today announced that PAC-MAN and other characters from classic BANDAI NAMCO Entertainment Inc. games are available for download for its FORIS FS2735 27-inch gaming monitor. The characters appear as animated notifications or “POP-UPs” on the FS2735 screen whenever gamers receive a phone call, e-mail, or other notification on their smartphone. This ensures that gamers who use headphones do not have to worry about missing an important call or e-mail because they could not hear their smartphone’s ringtone. The BANDAI NAMCO POP-UPs come in two packages of five POP-UPs each. One package consists of characters from PAC-MAN and the other consists of characters from the NAMCO classic titles GALAGA, GALAXIAN, and DIG DUG. Both packages are available on the Apple App Store and Google Play. Each package costs two US dollars or the equivalent. The POP-UPs are colorful, dynamic animations, such as a ghost chasing PAC-MAN, that move across the right half of the FORIS FS2735 screen. Gamers can assign any of the five POP-UPs to appear on the FS2735’s screen when receiving a notification. This allows for a customizable and enjoyable experience. Gamers need to install EIZO’s G-Ignition Mobile 1.2 app on their smartphones to download the POP-UP packages. The app is available free of charge on the Apple App Store and Google Play. G-Ignition Mobile 1.2 works with Bluetooth technology built into the FORIS FS2735 to make the POP-UPs appear on the screen. Transmitting the POP-UPs to the FORIS FS2735 is done through either Bluetooth or USB Communication using G-Ignition 3.01 for Windows. Please see the following page for details. EIZO and FORIS are registered trademarks of EIZO Corporation. 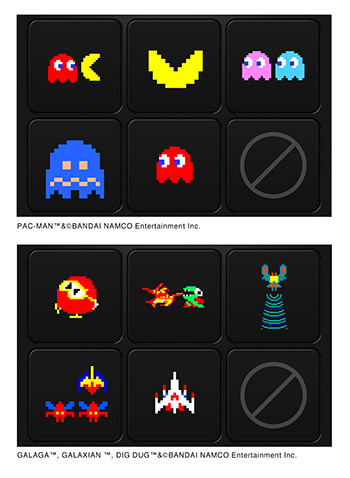 PAC-MAN, GALAGA, GALAXIAN, and DIG DUG are trademarks of BANDAI NAMCO Entertainment Inc.